That’s a lot of partners. 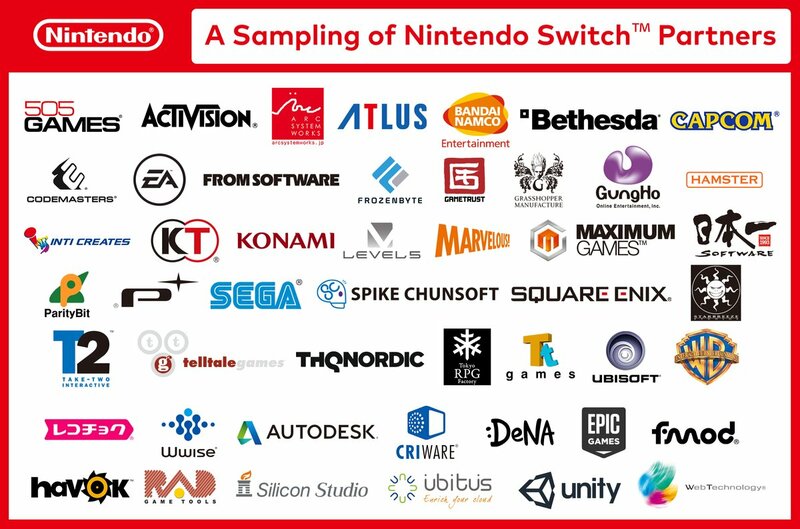 The Nintendo Switch is real, and coming, and there’s quite a slew of partners on board if Nintendo’s press release about the system is anything to go by. Let’s skip the preamble. Everything you need to know about the Switch, previously the NX, is already available elsewhere on the site. We’ve got news stories, hub pages, the works. But what about that third party support? This is a problem that’s plagued Nintendo for a while now. The initial list of third parties signed on for the game include the likes of Activision, Atlus, Bethesda, Capcom, EA, FromSoftware, Koei, Namco, Square Enix, Take Two, Ubisoft and others. The list is pretty impressive. We already know about a few games. Skyrim features in the Nintendo Switch trailer as their first big third-party get, but we also already know that Square Enix is bringing Dragon Quest to the machine and SEGA’s next Sonic the Hedgehog title will also launch for it. Ubisoft confirmed it will bring Just Dance 2017 to the console, and feels that “Nintendo will again redefine the way we play games” with Switch. “The Switch is accessible at its core and also seizes on the growing trend of sharing more experiences and playing anywhere at anytime,” said the company in a statement.